Some 733 units of three-storey landed residential properties with gross sales value totalling over RM700mil will be launched by June on the Penang island. The developers launching the properties include SP Setia Bhd, E&O Property Development Bhd and Chong Co Sdn Bhd. SP Setia Property Division (North) general manager S. Rajoo said SP Setia was ready to launch 392 units of three-storey terraced and three-storey semi-detached houses with a gross sales value of RM362mil before mid-2008. Rajoo said the group expected to generate RM200mil in revenue this year from the sales of new launches. “Some 172 units of the terraced and semi-detached properties, priced between RM800,000 and RM1.3mil, are for the Setia Pearl Island project located on a 112-acre site in Sungai Ara. “The remaining 220 units are smaller terraced properties with built-up areas of 2,200sq ft for our new project, Setia Vista, located on a 21 acre in Relau, the south-west district of the island. “Due to their smaller size, the Setia Vista properties are priced from RM658,000,” he said. Rajoo said there were about 37,000 units of landed residential properties of all types on the island. “These are all occupied. About 3,000 units of landed residential properties are being planned for launching and undergoing construction on the island. “Penangites know that in the next two to three years, there will hardly be any new landed residential property launches. This is why they are buying now. “Since last April, we have launched 558 units of three-storey terraced houses with a gross sales value of RM368mil, of which about 75% has been sold,” he said. Chong Co director Chan Foek Onn said the company planned to launch in the second quarter the Taman Pantai Indah and BJ Residency projects, comprising 209 three-storey terrace and semi-detached homes with built-up areas ranging from 3,000 to 4,000 sq ft. The gross sales value for both projects is RM182mil. “The Taman Pantai Indah scheme in Batu Uban near the Penang Bridge comprises 62 properties. 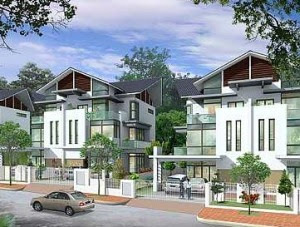 “The BJ Residency is a gated community project on a 8-acre site in Bukit Jambul, the south-west district of the island. “These properties will be priced above RM850,000,” he added. Chan said home purchasers were no longer looking for just a house with rooms and bathrooms. “Architectural designs and spaciousness for privacy counts. “For our homes, we provide Mediterranean and contemporary tropical designs that come with slope roofs, patios, open arches and large windows for breeze to flow in easily,” he said. E&O Development Bhd is also launching 132 three-storey semi-detached houses and three-storey bungalows with a gross sales value of RM180mil by June. Its marketing director K.C. Chong said the semi-detached houses with built-up areas of 4,000 sq ft were priced at RM1.5mil. “The bungalows, with built-up areas of 5,000 sq ft, are priced between RM2.6mil and RM3mil,” he said. Both the semi-detached and bungalow units come with five to six bedrooms, Chong said. PPC International Sdn Bhd managing director Mark Saw said the concept and theme of landed residential homes were equally important for the marketing of such properties. “For SP Setia's Setia Pearl Island scheme in Sungai Ara, the developer constructs its residential properties around unique landscape themes differentiated by aromatic plants and trees. “The Setia Pearl Island homes are within a guarded community, equipped with around-the-clock security and closed-circuit televisions,” he said. Saw said E&O Property's Seri Tanjung Pinang project was developed around the “lifestyle-by-the sea” theme.